There was a before the BP036 and an after. Before the BP036 I didn’t imagine that Koyudo could be that great with so many kind of bristles but when I received the BP036 I noticed that they simply could. I still have to find the ones that they really can’t handle well because so far, I am impressed with all of them. After I received the BP036 it opened a door for even more interesting options, today I will share my thoughts on these tiny kolinsky precision brushes. 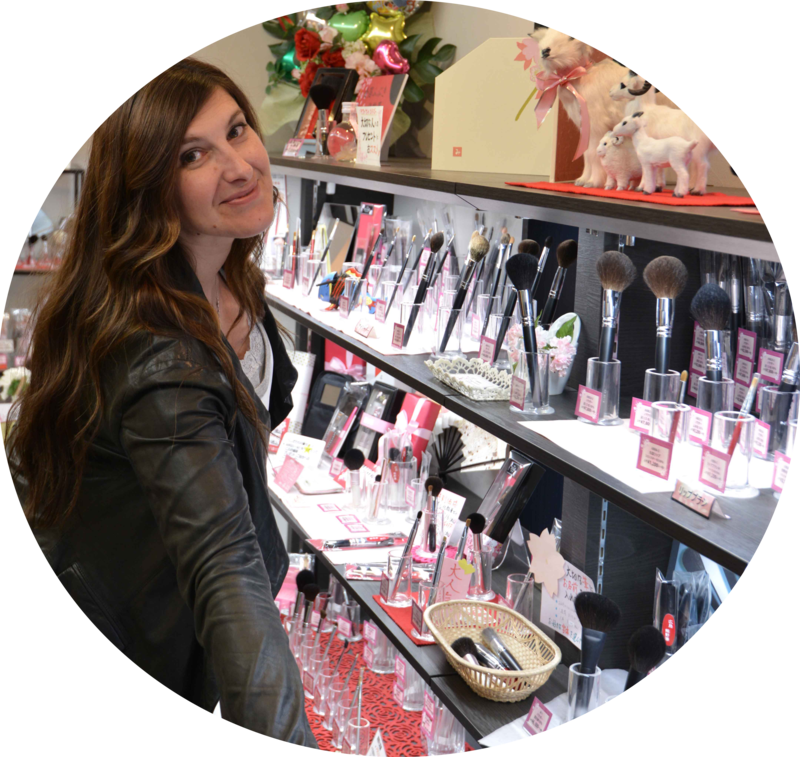 If you are a fan of little brushes for gel eyeliner or precision application and want the softest quality, you have to try one of these. You know I have huge problems with my skin, it just simply cannot stand harsh brushes, specially around the eyes. 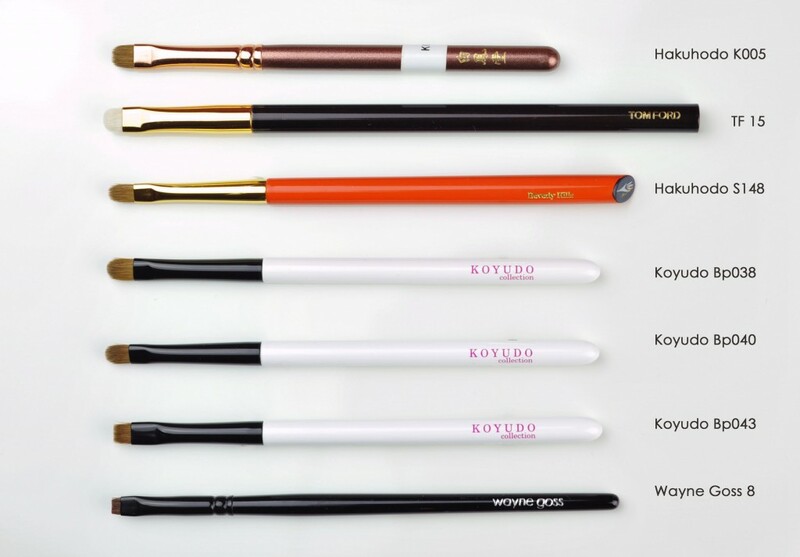 I used the Hakuhodo K007 for years -which is a fantastic eyeliner brush – but then I tried the Hakuhodo K005 and I preferred that shape, it was a bit easier to control. Don’t get me wrong I love those two K’s but I still wanted a slightly more flexible option that could still allow me to control how I apply the gel without having to worry about how it would feel on my skin if I have to try over and over again (not a specialist here so I need great tools). If you click on the names in the table (green) it will open the link where you can see them or buy them, I got mine at CDJapan. Since my skin around the eyes is so delicate and gets irritated so easily, I cannot use hard pencils but when I use creamy pencils they just aren’t precise at all. 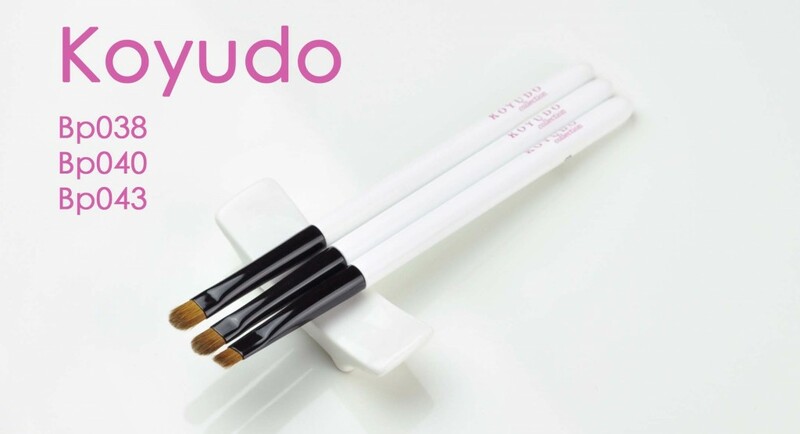 In that particular case I apply (rub) pencil on the back of my hand and then pick the product with the tip of a little round eyeliner brush like these 3 Koyudos and apply the products with the brush instead of the pencil. Any of these 3 brushes if great for transferring the product easily and you can even push because it won’t hurt your eyes. They are flat but have enough surface at the top to pick a nice amount of product and apply it evenly, there is no irregular or painful application here. When the color is lighter and I am not using a very dark gel liner, I prefer a thicker application. For that type of application a flexible and precise round brush is fantastic, like the BP038 or BP040, they just do the work so well. When you are used to work with such nice brushes and you go back to other less good tools, only then you realize how amazing they really are and how much they were helping you with the application. For that I prefer the flatter BP043 because you can push flat against the lashline. You can even mix pencil and powder, or use it with gel or wet it with a long-lasting product and then pick up the powder, you can set your eyeliner using powder with these brushes, etc etc I am sure you have plenty ideas, most certainly that all the combinations you may think of will work, so far I haven’t found something that needed precision and softness that I couldn’t do with them. When I do a smokey eye I often apply a cream shadow underneath but not all over the eyes, just very close to the lashline and then blend upwards, then I grab another round domed brush to blend and buff the edges. The space in my mobile lid is not huge and if I really want a sort of gradient smokey eye it the intensity has to start at the root of the lashes and as I blend reduce the intensity. It’s just difficult to place the most part of the shadow close to the lashline, often regular cream shadow brushes are too big for that purpose, but these little ones are just perfect for that. These three brushes are a fantastic investment (although you don’t need the three of them! ), for concealer, lips, brows, etc. The BP038 and BP040 are very similar in size, not that it really matters.. but, at this tiny scale a one millimetre difference has more impact than 1cm in much bigger brushes. The shorter one just delivers a little more precise application, the longer one has a bit more flexibility. 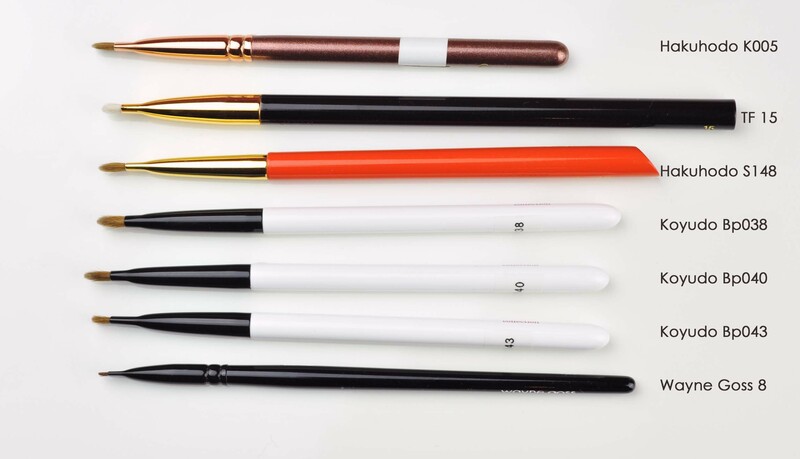 The BP043 is the one called “eyeliner” and the other two “eyeshadow” but you use them how you want to use them, the name is not important. The Tom Ford 15 is not as soft to use for me, not even as soft as the K005, it may definitely be a great one for you but I was a little bit disappointed in terms of softness, otherwise it’s a nice brush. The K005 is fantastic, absolutely easy to use, it has been my go-to for a very long time and is still one that I use on regular basis with gel liners, I really deeply love it (this is an LE set version of it). The S148 I prefer to use it for precision with lip products because for eyes I prefer the Koyudos, I prefer the spring of the Koyudo and how I can control them a bit more easily but please take note that eyeliner application is probably the most difficult and personal topic and the technique I use may or may not work depending on the brushes. The WG 8 is a bit too short for me, although when you define the lashline it does it with micro precision but I personally am a BP043 fan. Specially because it is softer but still has a lot of precision. If you dream of the exact BP043 but a slanted version of it, your dreams just became reality.. they have the BP044 (there is a mistake in the size on their site I think but you will spot it…). Amazing, they are so unique and great quality! I also saw the BP049 that is a pointy version of it and since I am really into little tiny soft brushes I really want to try it for concealer and lips, I wonder if it will spread out a bit or stay pointy once washed… I would love it if that’s a shorter-smaller pointy version of the BP036, imagine the surgery precision in concealer 😀 => in my cart it goes! Koyudo BP038, BP040, BP043 was last modified: September 24th, 2014 by Sonia G.
I need these then. Great new post format Sonia! I love it! Thank you for – again – a very thorough review. Two of them will go on my brush list, they really sound nice! Thank you for this post. I just purchased Lunasol’s Shadow Liner Brush N. I can’t wait for it to get here! I watched some videos and knew I had to have it because it is made of weasel hair and looks like something I don’t already have. I currently own the S162 which is slanted like the one you mentioned (BP044) but very precise and awesome for powder and gel liner. The S143 is very similar to the K005. I really like the small weasel brushes for MAC pigments. I also have the Goss one but use it rarely since it is so tiny! Also, you may already know, but Now E-project is doing a discount deal until January. It might be the time to get that KiwamiSet. 🙂 I thought about it, but still can’t justify the 1,700 dollars (and probably never will, unless money rains from the sky). BUT it is a lot better than 2,100! But I do LOVE the S148 for my lower lash line although I’be been addicted to the S134 lately 🙂 need to give my oldies some loving I guess…….. Thank u for reminding me of my detail brushes. Will start tomorrow!! I’ve been alternating between my Suqqu creamy eyeliner and the Pixi dupe for the THREE flash performance eyeliners. I’m quite in love with my G5515? Or is G5513? Can’t remember haha! I fill in my eyebrows with eyeshadow every morning. Which brush do you recommend for that? How about Koyudo Bp043? 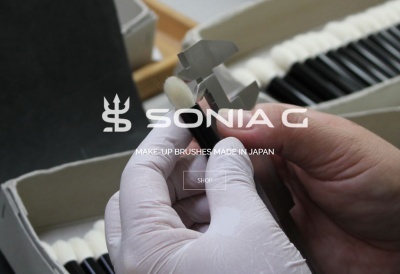 For powder liner, do you prefer Bp043 over K005? For powder I prefer the BP043, feels easier for me. For the brows it’s also fantastic, if your brows are quick thick like mine, I prefer the Hokuto Ho-gentei, just faster.